What are the best HQ Bird Cages for Sale? Welcome to our reviews of HQ bird cages and HQ bird cage accessories. 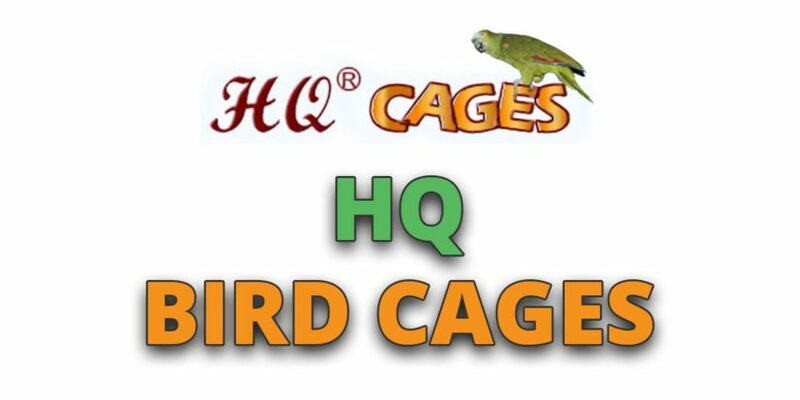 The HQ cages company provides a huge variety of bird cages and because of their quality and affordability, over 120,000 of these are sold each and every year. We looked at all of the popular cages on offer from HQ and then reviewed the best cages from a number of different product categories for you. When reviewing these cages we look at the design, build quality, internal features and price to determine which one was the top cage. HQ tends to be fairly affordable in comparison to other similar cages so you can easily find some cheap bird cages from HQ. What are the similarities amongst HQ Bird Cages? What to look for when buying a H Q Bird Cage? Very easy to put together, even with spare nuts and bolts. Instructions are pictures. Plenty of room for smaller sized birds and space for toys to be installed. Fairly heavy and sturdy with paint that is stuck on well. Well packaged and arrives quickly. Plastic food dishes are ok but a bit flimsy. A fairly nice roomy flight cage that’s ideal for people owning a number of small birds. Easy to set up and install, plus well designed and built. Dome style design looks attractive and the dome opens on top. Good for conures and small to medium sized birds. Wrought iron makes for a strong frame of construction. Bottom tray is made from plastic. If you’re looking for a medium sized bird cage for small to medium sized birds then this is the HQ cage to go for. Size is perfect for cockatiels, conures and smaller sized birds. Scroll design looks beautiful and open to give you birds an extra area to play in. The frame is sturdy and bars are thick so the top part of the cage is built to last. Open top design gives your birds extra areas to perch and play. The assembly instructions are not very useful. A nice alternatively styled design for people wanting an open top bird cage. This allows your birds to play on the top of their cages and provides them with more freedom. Aimed at smaller sized birds, this double flight cages provides loads of space. Lot’s of extra storage room on the bottom tray as well. Central partition is removable to make the cage much larger. There are breeding doors which is ideal if you’re into the hobby of breeding. Powder coated paint is thick and durable so smaller birds won’t be able to chew it off. If you’re a small bird owner that’s serious about your birds then this is the ideal cage for you. You’ll have plenty of room and it’ll be easy to breed your pets if you choose. Roof makes it possible to use this aviary outdoors. Has wheels so can be moved in or out of the house depending upon the weather. Lots of height for your birds to fly vertically. Plenty of space for additional toys and features to be installed. May not work with larger sized birds. Assembly instructions are difficult to understand – may require 2 people. If you’re looking for an aviary for your birds that can be used both indoors and outdoors then consider this option. Your birds will appreciate the extra height and when outdoors the roof will provide both shade and shelter. Typically, each cage comes with at least one perch, feeding/watering tray, access door and removable cleaning tray. All cages come with swivel wheels on the bottom which are bird safe and make the cages easy to move. The bars are usually developed using wrought iron and the wire mesh is made from galvanized steel after welding, both of which are bird safe. If any paint is used then it’s powder coated which tends to be safer than normal paint applications. A lot of the cages are designed with storage trays. All orders can be made online and delivered to your home. You’ll be required to assemble the bird cage. The HQ Cage Company has been selling bird cages since 1998 so they have decades on experience, allowing them manufacture quality cages at an affordable price. The cages sold by HQ normally fall into 2 categories. There’s cages which are aimed at small bird such as finches, budgies and canaries and then there are cages aimed at large sized parrots and conures etc. If you own smaller sized birds, then you’ll want the bar spacing to at a maximum be no larger than 1/2″. At a minimum you want the bar diameter to be at least 2mm. Whereas for larger sized birds you can increase the wire spacing gap to be at a max 3/4″ to 1″ whereas the bar gauge needs to be at a minimum 3.5mm but ideally 5mm. Also, check to see how difficult the bird cage is to set up as some may require a few hours of initial installation, something you’ll have to do on your own. When buying a cage you want to check which materials are used. Check that the cage bars are made from bird safe materials such as wrought iron, stainless steel and galvanized steel after welding. Non-safe metals include zinc, copper and lead. Also, you want the paint to be powder-coated paint as this sticks to the bars of the cage more easily and is harder for parrots to scratch off. Every cage needs to come with a certain set of features. You’ll need a perch for your birds to sit on and usually there’ll be several of these (depending upon the size of the age). Feeding and watering stations are sometimes included and they typically get made from stainless steel bowls (which are rust resistant and bird safe). These feeding trays might also come with small access doors making it easy to top up the food and water without opening the front access door. A removable tray on the bottom of the cage is also usually installed which makes cleaning the bird mess much easier as you can simply slide the tray out whilst the birds are still inside. The HQ Cage Company is known for making affordable bird cages that are large in size. Because of this you’ll be able to find medium sized cage starting at around $130. Larger versions of these cages with extra features such as playtops typically go for $150 to $250. However, if you’re looking for a specialized double cage or an aviary then the size increases considerably and so you’ll be expected to pay $350 to $500. If you’re looking for a used HQ bird cage then the best places to start looking are Craiglist (if in the US), Gumtree (if in the UK or OZ) and of course Ebay. However, there’s quite a few issues with buying a secondhand HQ cage. Firstly, you’re not going to be covered with their warranty or guarantee – so if there is anything wrong or broken with the cage then you won’t be able to get replacement parts for H Q Bird Cages. Next, because the cage is secondhand then you’ll need to be extra careful looking at the cage to see if there are any breaks, gaps or damage to the cage. You also won’t know whether or not the cage has been repainted or treated with some cleaning chemicals that are toxic and could harm your birds. So whilst you might get a cheap HQ bird cage when buying used, we recommend buying a new instead to save yourself from potential future hassle. For more information on buying a used bird cage, see our guide here. This bird play stand will keep your larger sized bird entertained for hours on end. It comes with 2 stainless steel feeding trays and wheels so the stand can be moved. HQ also offer a number of shreddable bird toys such as ropes, nest boxes, hanging swings and chewable pieces. These are good for kitting out the internal parts of your cage. I just got an HQ playtop cage for my African Grey. All I have are pictures and lots of bags of screws and locks. I have no idea how to assemble it. I have it laid out on the floor and I am totally confused.